FANBOY PLANET.com . : mc-injusticedeluxestatue :. Warner Bros. Interactive Entertainment and DC Entertainment today unveiled details for the Injustice: Gods Among UsCollector’s Edition. The North American package will be available beginning April 2013 in limited quantities for the Xbox 360® video game and entertainment system from Microsoft and PlayStation®3 computer entertainment, and will retail for $99.99. 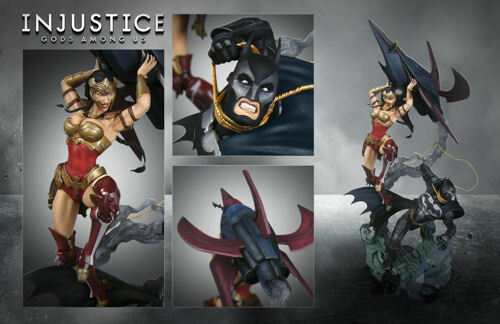 - Exclusive DC Collectibles statue featuring iconic characters Batman and Wonder Woman, the Fortress of Solitude and the Last Son of Krypton's escape ship. o Includes The Lasso of Truth, clear casted ice details and translucent smoke trail.